Are you interested in watching ABC on Kodi? In this article, we’ll explain which addons you’ll need to legally watch ABC content. We’ll also be touching upon their libraries, organization, and additional features to help find the right ABC addon for you. Kodi is a free-to-use, open-source media center application. It offers high levels of customizability, making it accessible to beginners and experts alike. Further, Kodi can be installed on most popular hardware, with dedicated apps for iOS, Amazon Fire TV, and Apple TV, among others. There are many addons that offer access to ABC’s content, but the majority of them aren’t don’t use licensed sources, and as such, aren’t legal. That said, there are a few legitimate addons that offer ABC, two of which are free to use. Some people connect to virtual private networks (VPNs) in order to hide unlicensed streaming from their internet service provider (ISP) or network administrators. However, VPNs have several legitimate uses and can significantly increase your online privacy, even if you only stream from official sources. VPNs work by encrypting your network traffic, which prevents any outside observers from reading it. This nullifies most types of Man-in-the-Middle attacks, and stops your ISP from selling details of your online activities to third parties. It also stops them from using your browsing habits as justification for throttling your connection. Every VPN is different; some are faster than others, some log more information, and unfortunately, some even come bundled with malware. For these reasons, choosing the right VPN is crucial. We recommend IPVanish. It provides fast, consistent connections to self-maintained servers all around the world. This service doesn’t log any information about your activities. Finally, IPVanish has excellent multi-platform support, with apps for most platforms, including Windows, Mac, iOS and the Amazon Firestick. STREAM SECURELY:IPVanish is privacy-conscious, secure, and fast enough for flawless HD streaming. Below, we’ll list official Kodi addons that offer ABC streams. All of the following addons use official sources and best of all, they’re all free to use. The library appears to be organized alphabetically, but towards the bottom, it starts to get considerably less straightforward. There are duplicate folders, videos with titles like “Vdka4087511,” and in one case, an inaccessible folder with no name whatsoever. Despite these anomalies, the first half of the library works as you’d expect, so there’s really no need to go this far down the list in the first place. There’s a good mixture of old and new content on here, with classics like Flashforward and America’s Funniest Home Videos alongside more modern releases such as Marvel’s Agents of Shield. Content is updated frequently, as evidenced by the availability of up-to-date Good Morning America episodes. This is because the content is scraped right from ABC’s official website. ABC’s content is only available from within the U.S., so you’ll need a VPN to watch from overseas. You should note that IPVanish doesn’t work in this case, returning an error which says “Video not available at this time.” ABC’s region-locking isn’t infallible, though, as NordVPN still works. 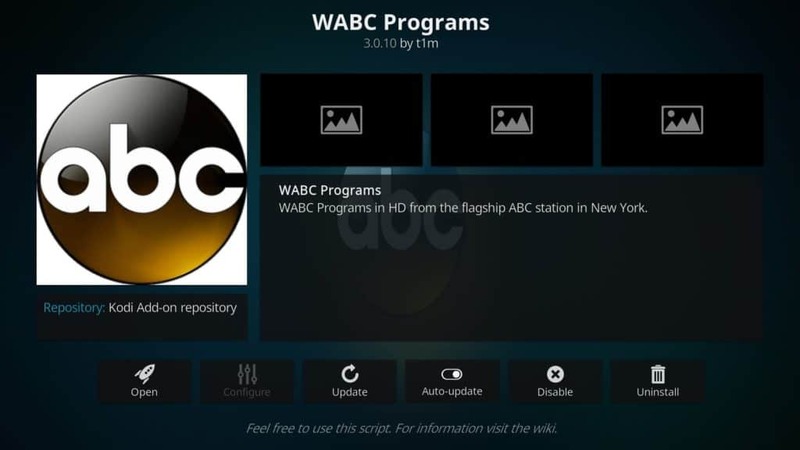 The WABC Programs addon can be found in the official Kodi addon repository. USTVNow is a service designed to let members of the US armed forces watch American TV while stationed elsewhere. However, the service doesn’t require any proof of identity and as such, anyone can sign up. The USTVNow addon simply makes its content available from within Kodi. USTVNow has a free membership option that comes with seven different channels including ABC. Now, it’s important to note that this tier only offers standard definition live streams, not on-demand content. On the plus side, due to the nature of USTVNow, all geo-restrictions are removed. This means you can watch its streams from anywhere without using a VPN. Paid plans also offer DVR capabilities so you can record your favorite shows. There’s a built-in TV guide and a search function so you can see what’s available at a glance. Premium users can also access an additional 18 channels. USTVNow is available from the official Kodi addon repository. Unfortunately, not all addons use official sources for their streams. Below, we’ve listed some of the most popular third-party Kodi addons that are frequently recommended on less than reputable forums. It’s important to note that this is not an endorsement; it can be difficult to tell if an addon is legitimate or not, and the list below is intended to remove any doubt. These addons represent a fraction of the completely legal content available on Kodi. If you’d like to expand your library further, why not check out our guides to the best addons for live TV, sports, cartoons, anime, and movies? Finding the right addons is just the beginning, though. Kodi can be tricky to use, especially if you’re new to it. With that in mind, we’ve created step-by-step tutorials to reducing buffering, setting up subtitles, and solving any problems you might be encountering.